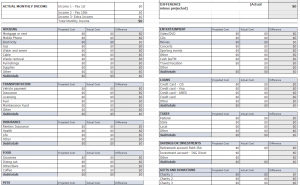 If you plan on creating a budget, you’re going to not only need to create a spreadsheet to visually look at it, but you’re going to need to break down your spending categories as well. This will make it much easier, of course. 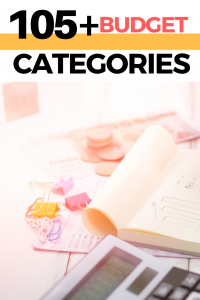 With a TON of budget category options available, I wanted to break down the most popular personal budget categories, leaving it up to you to determine which category is best for that spending. 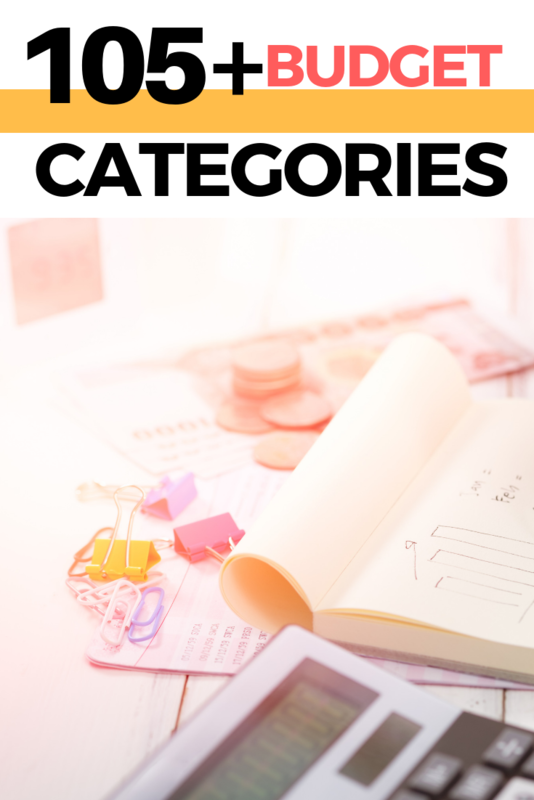 To start off your budget right, here are the most popular personal budget categories as well as a few awesome 100% free budget spreadsheets you can download for free near the end of my post. 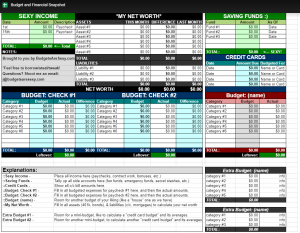 These free budgeting spreadsheets will make your budgeting a lot easier, trust me! Listed below, I tried to include as many personal budget categories, from the simple basics to the more advanced, I could research and think of, listing them in alphabetical order. Granted, you may not need them all, but I just wanted to include them as some are absolutely essential while other categories are only recommended. To be safe, just check off the ones you figure you will need for your budget. 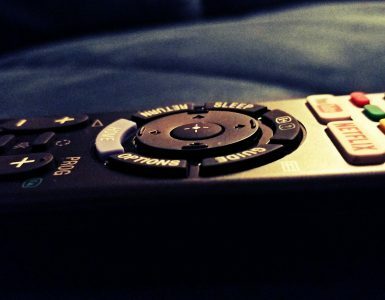 In short, it’s really up to you to determine which categories are best for you and your family. What’s a budget without income coming in? Don’t forget to include all of the money that comes in for the month. Let’s start with this first, followed by all of the monthly expenses. Some see this as a necessity, whereas others may only need clothing here and there. Regardless, it’s a category to consider. Worst case, start a small fund so you do have the cash on hand when you need some clothes. For some, debt needs to be considered as you do need to pay it down monthly. Sooner or later, let’s hope this category isn’t even an option if you’re stuck in the hole. Education needs to be thought about in many forms. 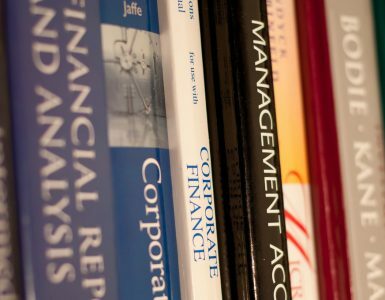 Whether you send your child to a private school or are in college yourself, here are some miscellanous education sub-categories to consider. Most financial experts recommend having a minimum of six months worth of expenses in a separate account considered your “emergency fund.” Don’t even think about touching it as it will get you through the tougher times in the case of a job loss. Also, consider creating additional separate savings accounts for future vacations or a big-ticket purchase you want to buy. Well, we all need food to survive, so of course, you will need a food budget. Let’s face it. Most of these categories are pretty boring, and if we could, we probably wouldn’t want to pay any of them. But who says we can’t have fun? I highly recommend you keep a seperate “fun” fund to ensure you save your sanity. This category is often an oversight as many don’t think about this expense until the day of. With so many special occasions held throughout the year, it doesn’t hurt to have a small budget to help ensure you have a few bucks for a gift. Some see this category as an absolute must, while others may only give depending on their current financial situation. No one is judging you here, but of course, giving is always a nice thing to do! As much as we would all love to stay healthy, medical bills are coming sooner or later. Heck, even if you are healthy, you still need to think about those annual physicals and dental checkups. This category can vary depending on your insurance coverage. In this section, these bills can vary, greatly depending on your circumstances, but you cannot forget about them, especially if it’s a recurring monthly bill. Don’t forget about retirement as your future self will thank you! Of course, it’s always voluntary, but you should never depend solely on Social Security. 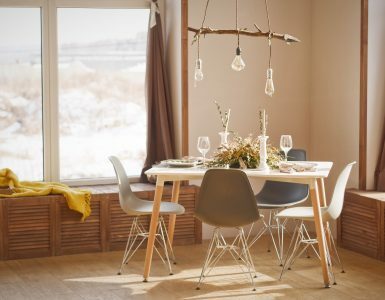 Like food, you need a roof over your head, and even if your home is paid off, this category is still necessary as additional shelter expenses need to be thought of as well. Those who are self-employed know full well that they need to send in quarterly tax bills to the government. 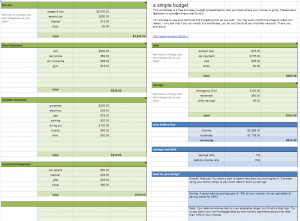 I will probably create a post in the future on the many free budgeting spreadsheets on the web, but for now, I wanted to highlight some of them that won’t cost you a dime. In case you missed it, I did write about the many Mint.com alternatives, with some free budgeting apps listed there. 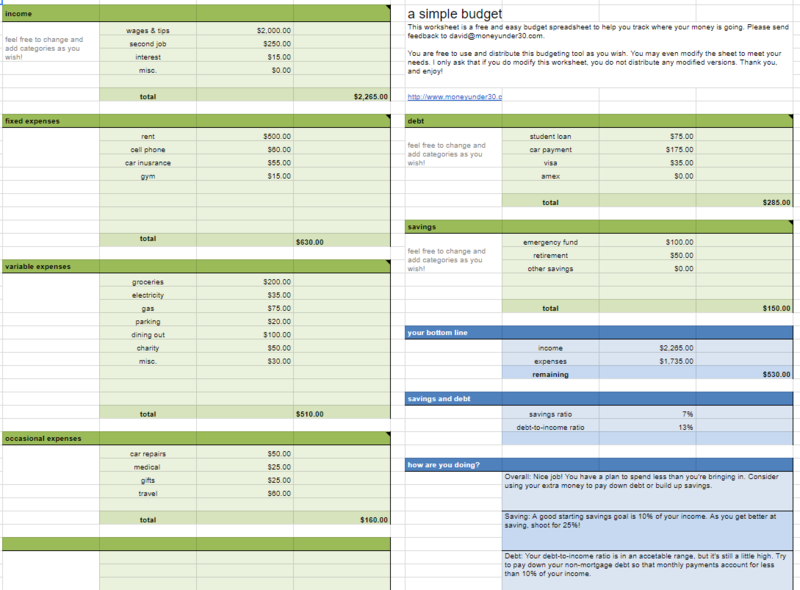 If you’re serious about budgeting, then I highly recommend downloading one of the following spreadsheets to make budgeting that much easier. 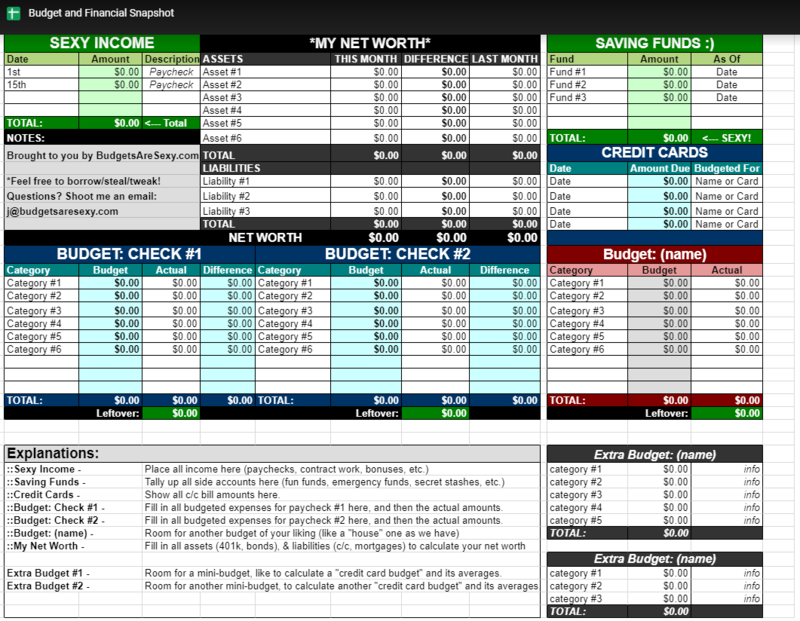 This “Financial Snapshot & Budget” from BudgetsareSexy.com is pretty colorful and is a very simple way to keep track of your budget. Input paycheck details, track your net worth, watch credit card balances dwindles and even watch your savings grow. Available in a Google Doc and Excel format. 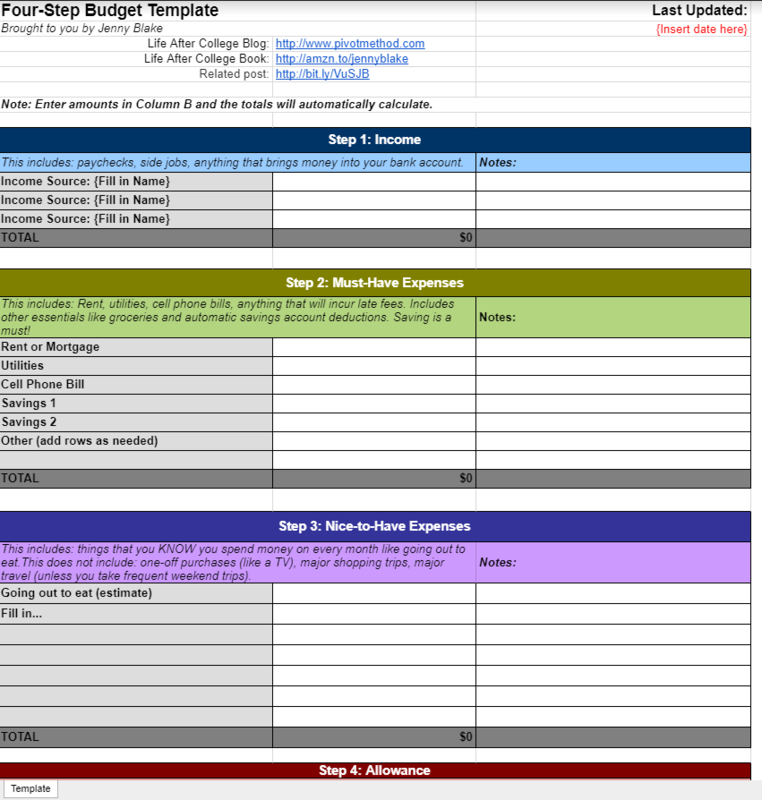 The “4 Step Budget Template,” created by LifeAfterCollege.com is a very useful four-step budget template. Start with your income, followed by your “must-have” expenses and then the “nice-to-have” expenses. Lastly, you will get a monthly allowance, which allows you to spend on additional items throughout the month if you so choose. In short, it’s a great budget to make sure the primary bills are paid for the month to let you know where you stand. 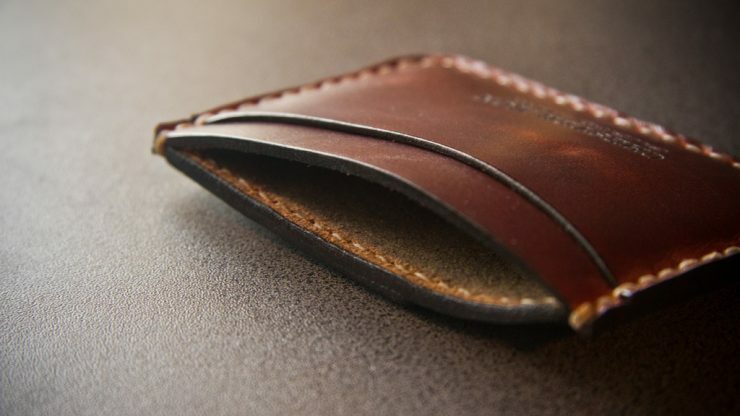 A very simple budget template that gets the job done. 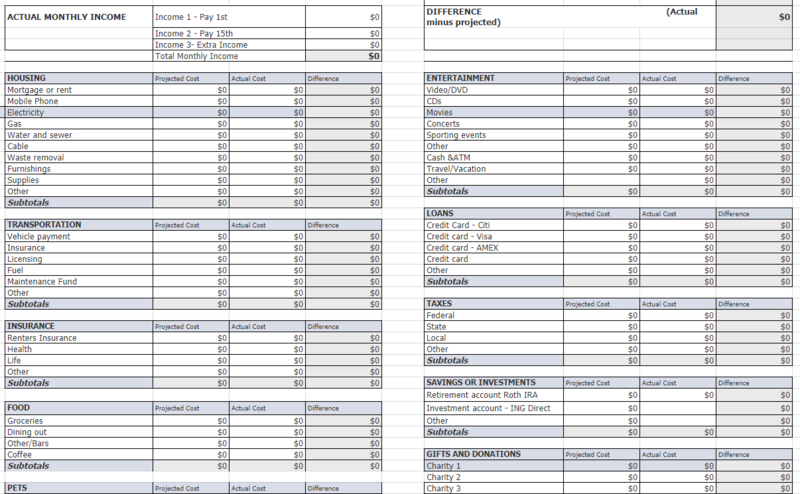 To use, type in what each item costs and then assign it to the item’s category. From there, you can see the total amount spent with the amount you budgeted for the month. Remember, you do not have to use all of the categories I mentioned above. Instead, pick and choose the categories that you know, for a fact, that you use monthly to make it easier to budget. By writing down and even preparing for your future spending every month, it’s going to make it so much easier and a lot less stressful when it comes down to your personal household spending, I promise you that much. It’s also so much better when you know where your dollar is going. If I’m missing any categories, do let me know as I would love to add them! The same can be said about the free budget worksheets. 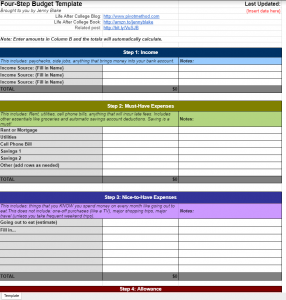 I know the free budget worksheets list isn’t all that long, but I do plan on creating a list in the near future, all of which I will link here when done!